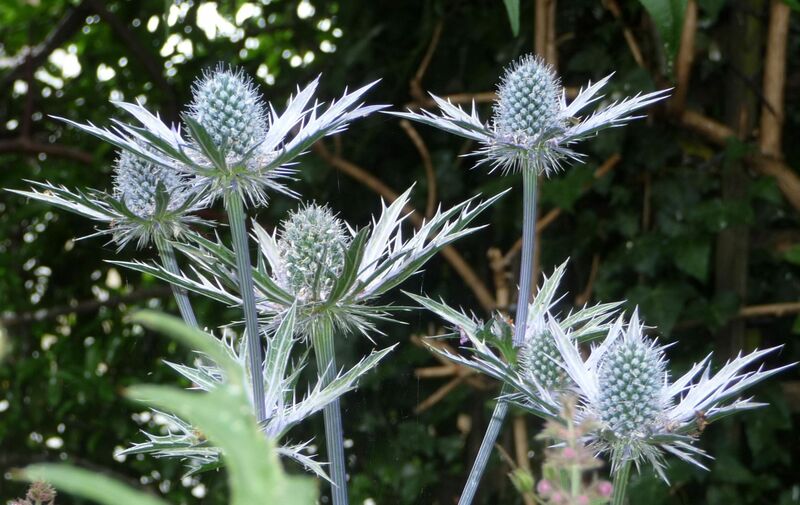 The Eryngium is is an elegant plant – its spiky, metallic flowers are called ‘Architectural’ by garden designers. 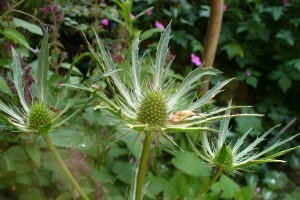 Wikipedia quotes Falstaff, praising the Eryngium as an aphrodisiac. Bees, Butterflies and other pollinators are unbothered by any of that, and seek out the Sea Holly for its nectar. This is a plant which requires bright light and good drainage. It tolerates wind, drought, salt spray and sandy soils. 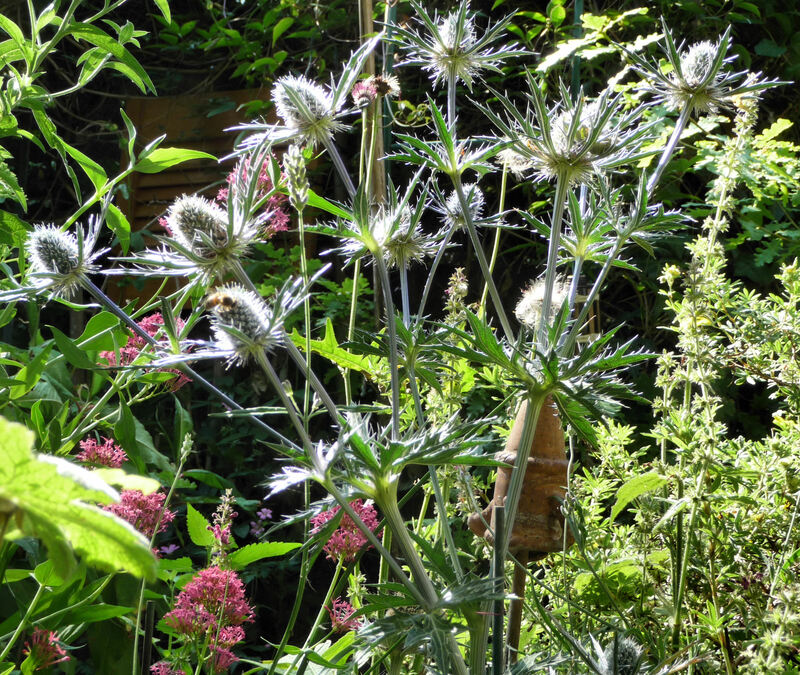 After its season has ended, the dried Eryngiums can be left in place through the winter. They look striking coated with frost. 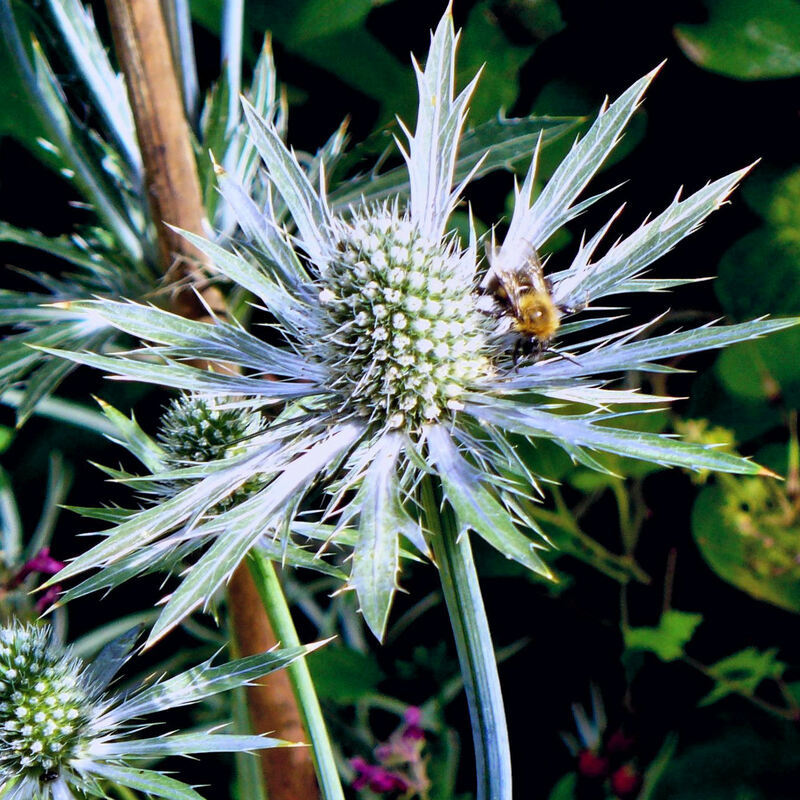 Here at Highbury, Bees and other pollinators came to drink the nectar of Eryngium zabelii ‘Big Blue’. 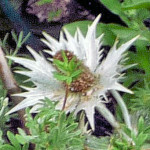 It survived its first winter and began to emerge from the soil the following spring. But its early growth was eaten, probably by mice or squirrels, as slugs and snails were not yet out and about. There was no ‘Big Blue’ that year. 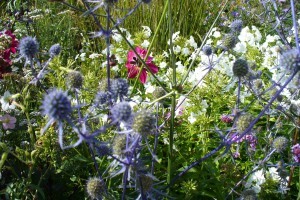 The following spring, nearby plants shot up more quickly than ‘Big Blue’ and shaded it out, stunting its growth. Since then, with attention paid to keeping the neighbours trimmed short in spring, ‘Big Blue’ can be relied on to grow tall and bring on the Bees. 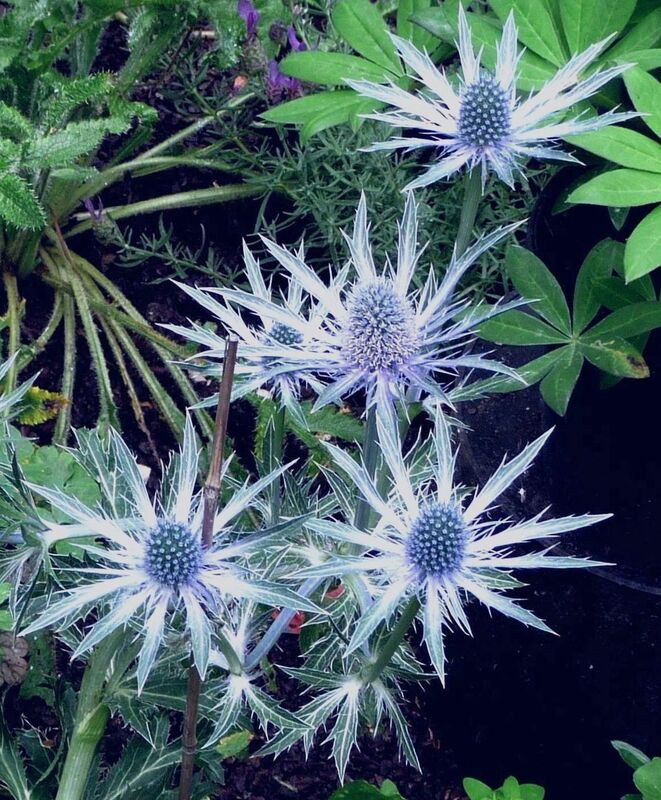 This year Eryngium ‘Silver Ghost’ was a new arrival to keep it company. The native Sea Holly (Eryngium maritimum) likes sandy soil. 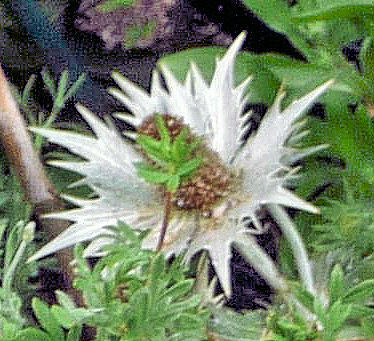 Its flowers, which bloom from June to August, are followed by egg-shaped fruits. Its roots, which can reach 2 metres (6 feet) in length (!) 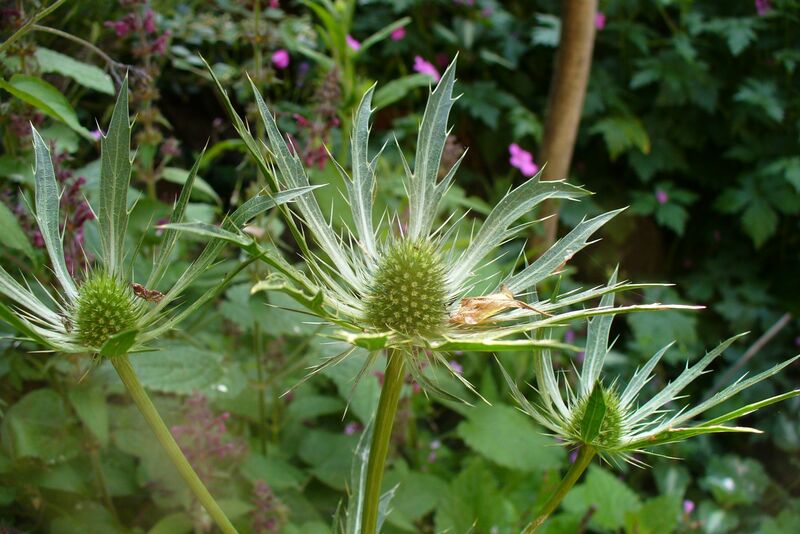 were dug up and roasted, or candied and eaten as sweets (‘Eryngoes’).